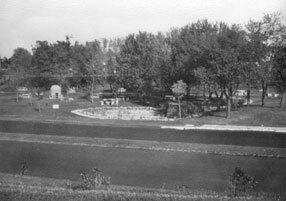 The original Lilac Park, also known as the Minnetonka Road Parking Area, was located in a half-mile segment between Minnetonka Blvd and 28th Street in St. Louis Park. It was built, like the others, in 1939. 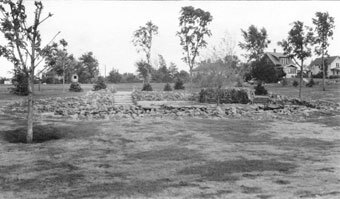 The photo above from 1939 shows the park from across the highway. 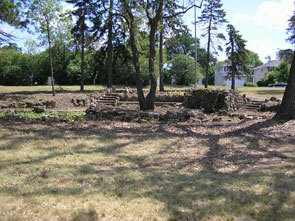 The beehive, seen above, is a stone barbeque that could accommodate three families. Click here for the story of how the beehive was built, how it deteriorated, and how it was moved and restored. 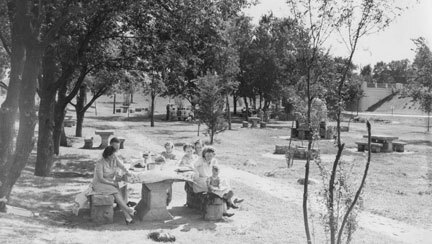 North of the Beehive picnic area was a rock garden that was cut off from the rest of the park in 1968. The photo below was taken in 1939. 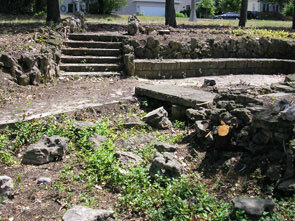 As of 2009, the remains of the rock garden are still on site. Photos below by Steve Raymer.